Circle of Blue Senior Editor Keith Schneider puts an eventful week into a global perspective. 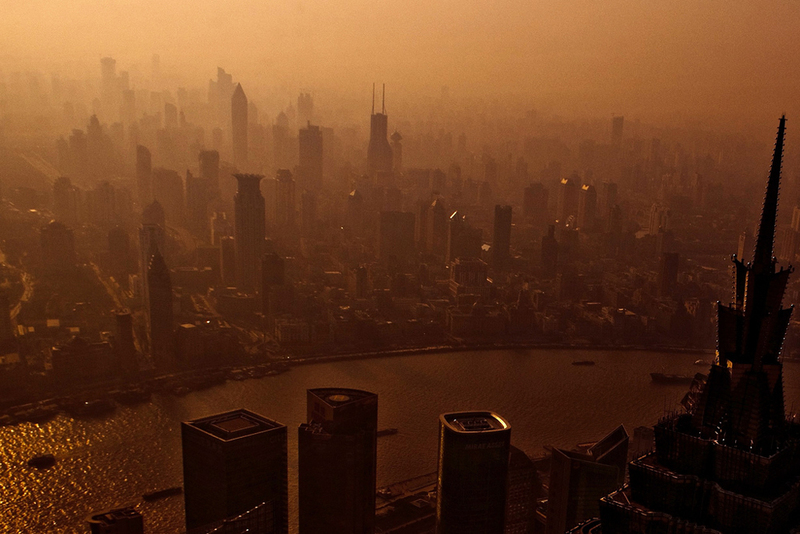 On Friday, China said it would introduce a cap and trade program to reduce climate change emissions. The same week, Volkswagen admitted to installing software on 11 million of its cars to cheat emissions tests.Click image to enlarge. NASHVILLE, Tenn. — Progress never unfolds in a straight line. The color and patterns of life, like tracking clouds from space, are too complex, too irregular, too imperfect to make sense much of the time. Once in a while, though, a flawless aberration occurs, like the events last week in the United States and China. Pope Francis arrived in Washington and New York to issue a call to action on climate change and an appeal to take much better care of the planet. Earth’s perilous condition soared to the top of the pyramid of public concerns. 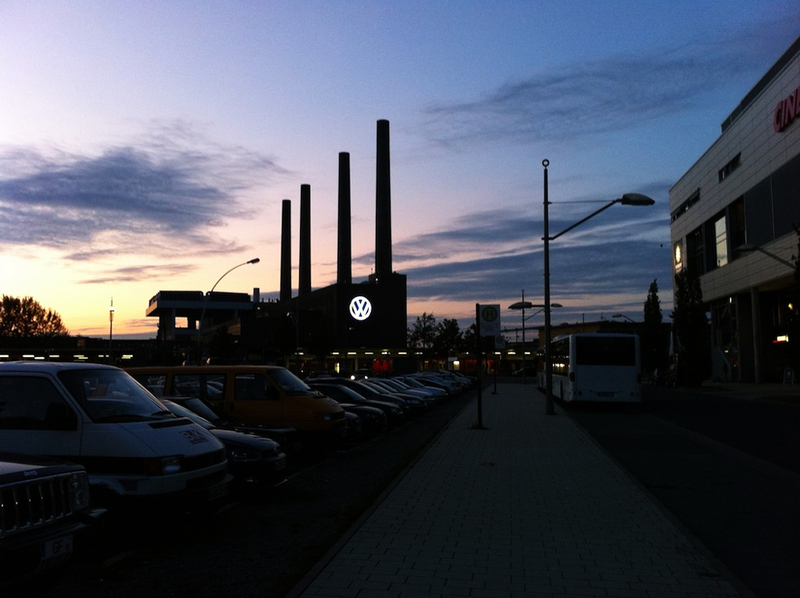 Volkswagen, one of the largest industrial corporations on Earth, admitted to a potential corporate-collapsing fraud in the ecological performance of its diesel engines. The discovery, and the admission, that VW developed software that enabled its engines to detect emissions testing equipment and evade lawful limits for air pollutants illustrated just how seriously auto buyers and regulators take their responsibility to care for the planet. Though seemingly unconnected, these events are linked in new ways. They are both irresistible and emblematic of the unyielding transition in economy and ecology occurring across the world with quickening and visible speed. What draws them together, what gives them coherence, are the converging and unrelenting global trends in natural resource supply and demand, and the effects of industrial damage, that more people and more of the world’s leaders finally recognize and are reacting to with the urgency that is merited. 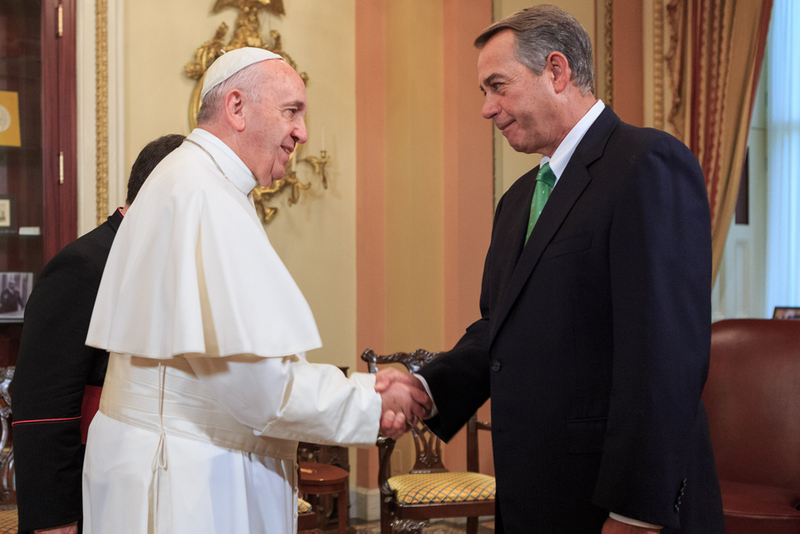 U.S. Speaker of the House John Boehner welcomed Pope Francis to Congress last Thursday. The next day, he resigned from his position amid pressures from a fractious Republican Party.Click image to enlarge. The change, disorienting to some, fearful to others, also heavily influenced the fourth dramatic and unexpected event last week — the resignation of Ohio Congressman John Boehner as speaker of the U.S. House of Representatives. His party’s doctrinaire caucus is lost in a world ebbing away. Aggressively advocating a 20th-century economic development strategy based on profligate resource exploitation? Promoting an inflexible 19th-century religious and social contract that does not fit the self-aware, self-actuating conditions of the 21st century? Neither the planet nor a good number of its human inhabitants accept such hazardous and obsolete views of human dominion. Fifteen years into the 21st century the conditions of ecological distress, and a clearer path to a reasoned response, are coming into focus across the world. Both the distress and the response are formed from two primary ingredients: mankind’s industrial depredations and the planet’s powerful and truculent response. Think of it as a promissory note coming due. The underlying principles of economic progress in the 20th century — an assumed infinite treasure chest of natural resources to stoke an economy of unlimited consumption — no longer fits an era with 7 billion people clamoring to thrive in a world not only growing warmer and drier, but also more vulnerable to floods and ecological calamities. The nutrients that supported the 20th-century way of life — cheap fossil fuel, vast supplies of fresh water, and ample land — are no longer so readily available. Summed up, the lingering industrial and demographic momentum of the 20th century — rising population, wasteful use of water, fossil fuel foolishness, mega-project development — is running hard into the ecological realities and impediments of the 21st. The resource-consuming way of life many nations pursued in the 20th century has smashed into the era of resource scarcity in the 21st. Pope Francis recognizes the new reality and has cast climate change as an ecological threat with moral dimensions. The poor and helpless around the world are already suffering considerable hardship from calamities that have no borders and no restraint. Industrial companies are held responsible for enhancing the public good with cleaner, more energy efficient, more resource-conserving products and practices. When they fail to do so — as the 2010 BP oil spill in the Gulf of Mexico and the discovery of the VW air emissions fraud show — the public penalties are significant enough to threaten the company’s survivability. Also last week, German automaker Volkswagen admitted to installing software on 11 million of its cars to cheat emissions tests.Click image to enlarge. And when political parties pursue goals that serve narrow and inflexible interests, but make scant sense in a universe of swift social, economic, and environmental evolution, the rusted fasteners that held the enterprise together begin to fail. For too long our capacity to understand and react to the era of climate danger and resource scarcity was obscured by indifference, hostility to change, and the marketing of a billionaire-class narrative. We’ve been told that with some minor tweaks, like deregulating polluters, lowering taxes, and looking for answers in the Bible, everything was going to be just fine. Not quite. There is nothing like deep droughts on six continents, drowning two American cities in coastal hurricanes, unleashing a killing plague from the African rainforest, or buckling Japan’s nuclear sector with a tsunami, to seize public attention. And with so many gazes now fixed on the power of the planet to cause mayhem, a much larger intellectual space is opening for a more mature and accomplished international reckoning.